Mistletoe management season looms, how do you do yours? 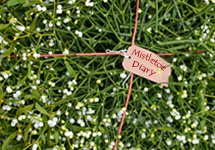 After Christmas mistletoe tends to fade away for most people – until Christmas comes round again of course. But for those who grow mistletoe, deliberately or by chance, January is a good time to think about any management that might be needed. Small amounts of mistletoe are not a problem for the host tree, even though mistletoe is a parasite that takes over the branch it is growing on. But large amounts can become a significant, even life-threatening, burden for the tree, and these need to be managed. January, February and March, with the host tree still leafless, are ideal for mistletoe management as the mistletoe can be readily seen and assessed. And there isn’t the temptation, present before Christmas, of only cutting the most attractive berried branches. Mistletoe pruning now is just pruning – not cutting for Christmas decorations! But how often is mistletoe managed (judging by some old orchards in the Severn Vale a lot isn’t!)? And how is it done? I know how I do it and how I advise others, and I’ll be talking about that in the blog over the next few weeks. But in general? Finding out how (and if) other people manage mistletoe was one of the aims of the Mistletoe League project I set up a few years ago. That project, basically some questionnaires about mistletoe management in orchards and gardens, was re-vamped this winter, with a new simpler (I think) website and new questionnaire forms set up via Google. So, if you have mistletoe in your orchard or garden why not spend a few minutes looking at the website and taking part in the questionnaire? Results, when there are enough of them, will be made available for all.